Several years ago, Fathia Absie made a compelling documentary, Broken Dreams, about the Somali youths missing in Minnesota. It was a bold film project that stirred debate within the Somali community about the reasons why two dozen young Somalis in the Twin Cities left the U.S. and joined Al-Shabaab. In her new film, The Lobby, Fathia departs from the well-documented, hard-hitting issue of terrorism and focuses instead on a close encounter of two people from different cultures, an American man from northern Minnesota and a Somali immigrant woman. 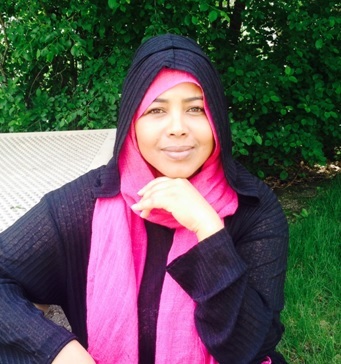 Filmmaker Fathia Absie in Minneapolis on June 6, 2015 (Photo: Courtesy Fathia Absie). John (Doug Sydney) and Yasmin (Fathia Absie) live as neighbors in the same apartment complex in Minneapolis. They exchange glances occasionally but never talk to each other. John sees Yasmin mostly sitting in the lobby, pondering and taking some notes. He is curious about this strange-looking woman with Islamic attire and wonders why she always hangs out at the lobby. Yasmin, on her part, is curious about John. Then, one day John musters the courage to approach Yasmin and introduces himself. What follows is a minefield of small talk, laced with curiosity, apprehension, nervousness, and cultural sensitivity. John is aware of who he is: a white man who has a simple background and, in his words, “has lived a life of ease and privilege.” Yasmin, on the other hand, is the product of a tough upbringing, having been raised in Somalia, a country that has witnessed civil war, displacement, and poverty. Most of all, she has lost loved ones back home to undue violence. In spite of her past ordeals, Yasmin comes across as a strong woman who has weathered extraordinary hardships but still possesses amazing self-confidence and a sense of humor. She is as smart as she is pretty and does not hesitate to take the lead in her conversations with John. She seeks neither sympathy nor acceptance from John. She welcomes any personal questions and tells John, “I am not fragile.” As the pair come to know each other better, they develop a certain comfort level and mutual attraction to each other. They start longing for these meetings in the lobby but discover that life is full of twists and turns. In The Lobby, John sips Somali tea for the first time as Yasmin smiles. The Lobby is a metaphor for something bigger and deeper than the simple meeting of two people. It is a portrait of how two members of different cultures, who had coexisted and cohabited in the same place without knowing anything about each other, can tear down the barrier between them and start relating to each other. Physical proximity to one another means nothing if there is no communication or understanding of each other. It has always been one of the main themes of Fathia Absie’s work: Communication is the way for people of all cultures to relate to each other. Fathia is a die-hard humanist and an idealist to the marrow. She envisions a world in which all kinds of people can live happily together, regardless of the artificial barriers they have erected between each other. Fathia believes all people share one noble attribute: their common humanity. Some skeptics see Fathia’s enthusiastic idealism as naïve and impractical, a clear reflection that some sectors of the society can be unkind and unforgiving. Others will shudder at the exchange of banter between a Muslim woman and a man not related to her. This film, produced on an extremely low budget, is artfully crafted—a testimony to Fathia’s artistic maturation. The acting is great and the dialogue uniquely enriching and entertaining. Fathia is as good at acting as she is at directing. No other actress can better portray Yasmin than Fathia. She can say a lot without uttering a word. She is polite, sensitive, and has an upbeat personality. Her colleague, Doug, is equally impressive and does a good job playing the role of a privileged man who comes around to be appreciative and understanding of other people’s cultures. Like Fathia’s first documentary, this film will generate lively discussions among many Somalis and Minnesotans, something Fathia thrives on.